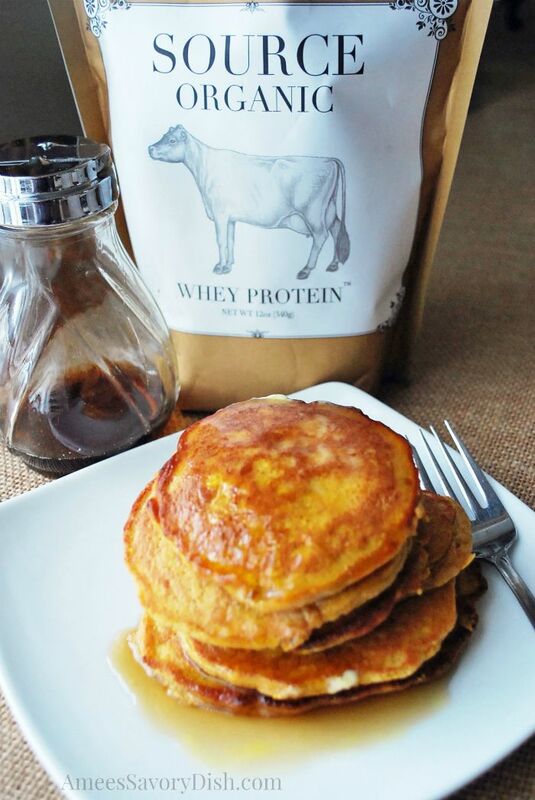 These pumpkin flax protein pancakes are not only healthy, but they are delicious!! There are benefits to being stuck home in an ice storm…new, scrumptious recipes are born out of my boredom. 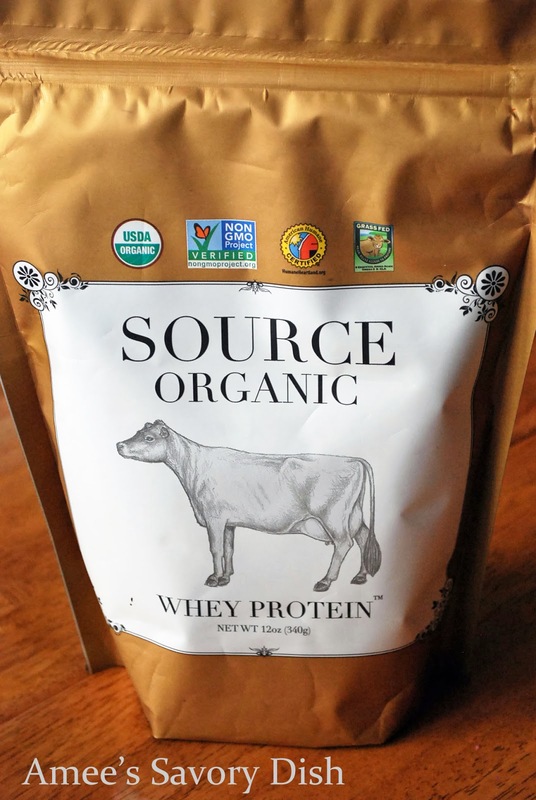 I used unflavored whey protein from Source Organic…very pure protein powder made from the milk of grass-fed Jersey cows. Whey protein that comes from cows that are able to graze year-round in the pasture are rich in CLA’s and Omega-3’s. There is no weird flavor or aftertaste with this protein powder, it doesn’t alter the taste of your recipes, just adds more wholesome goodness. It’s a perfect addition to kid’s smoothies and milkshakes, too! Stir all ingredients together with a whisk until well incorporated. Heat a skillet or griddle pan over medium-high heat. Melt coconut oil on griddle and drop batter in 1/4 cup size drops onto hot pan. Cook pancakes until they start to bubble up and then flip to cook the other side (should be lightly golden brown before you flip). Serve with a dollop of grass-fed butter and real maple syrup or homemade apple butter. *Source Organic provided me with a sample for review. No compensation was received for this post. All opinions are my own and not influenced in any way. I have been experimenting with protein powder in my smoothies and recipes and my favorite – homemade ice cream! I’m excited to try this, as it sounds wonderful and so good for you. I avoid dairy but would love to have my husband try this! I worry about him using non-organic dairy products. 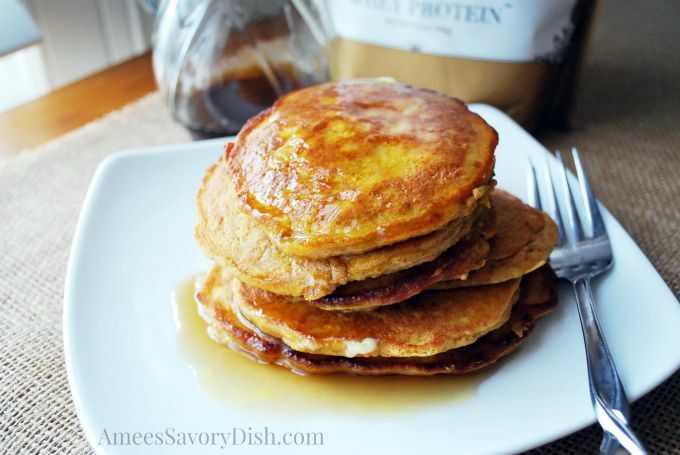 I love pumpkin pancakes – great recipe! Anything with a cow on the front is good stuff!